Haven't you redeem your coupon yet? 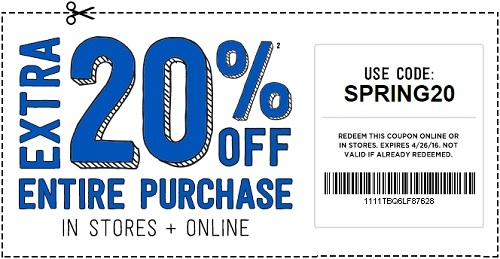 You should do better and visit your nearest Crazy 8 store location in the U.S. or Crazy 8 online and shop with printable coupon (or promo code) and receive 20% discount on your entire purchase! Hurry up, offer ends today Tuesday, April 26, 2016! To receive the offer online use promo code SPRING20 at checkout. Source of the information is Crazy 8. For more details visit your nearest U.S. Crazy 8 store location or Crazy 8 online.